Locations: Tehachapi Loop, Colton Crossing, Sullivan’s Curve, Cajon Pass/ Summit, Stockton Jct., Daggert, San Bernadino, LAUPT, Needles, Barstow and more..
Sources: Over a dozen film credits. Charles Smiley has a video credit. Santa Fe Railway in a 40 year timespan, gets the Charles Smiley treatment. In this presentation, we benefit by getting the ultimate scenes from some other CSP titles, that have been retired. The multiple cameras provide some unique viewpoints as we pay a visit to the pre-merger Santa Fe. We see much early footage with plenty of F7’s, in warbonnet passenger and the blue/ yellow freight schemes. SF Chief, San Diegan, Super Chief, along with mail trains. A full chapter covers some passenger train operations. Alco ATSF PAs are rare on film. Passenger led by F- units at Sullivan’s Curve. The Super C, a premier, top prority, hot freight train, is found in later in the show. Maps play an integral role, and with a sprawling railroad , plus a fast paced program, we need the maps! They are high quality maps, and really people, CSP is always about quality. The old films are very clean overall, and look to be enhanced, but not overdone. Well lit and with good color balance, The sound is also well done, and a nice match overall. Alco PA units are shown in service. The SPSF Kodachrome units get a segment and the FP45 in particular. An original displays the new warbonnet in 1991. There is also the 1993 update seection. Modern Santa Fe Superfleet action. Tehachapi Loop has some film shot from a Southern Pacific, black widow led, San Joaquin passenger train. Santa Fe runs some F3 and F7 units. The 1971 film has 2nd generation locomotives with, the pinstripe blue paint scheme. Cigar band on this F45. Some other locomotives: Alco RSD15 , EMD models; SD45, SD24, GP30, and various Alco models. The scene updates to the yellow warbonnets. Many views, very nicely done. A compelling segment around Bealville. Check the map for that place. At Bealville, the freight cars roll by for a look at a 70′ s era consist and many freight cars are seen, Some GP35, GP30 mid- train helpers are viewed. Colton Crossing includes fine vintage trains. Note the holy cross logo on this Geep. Great inclusions, of old ATSF 40′ reefers and various old boxcars. In a deftly executed move, the map gets us from Colton, via San Bernadino to Cajon Pass. I enjoyed Cajon Summit. Unusual, the summit is featured and some historical background that is film supported. Compared to the modernized version, with elevation and track changes there. Santa Fe Vintage West, contains a very well-organized presentation of the varied material . This is in actuality, a tale of two Santa Fe Railways. The old classic version, with 1st and 2nd generation locomotives, along with the appropriate freight and passenger consists. A newer Santa Fe with the eye candy Super Fleet power and the modern, standardized freights. A majority of unit train and TOFC hotshots. Some small connecting railroads get a quick nod. Narration is informative and delivered in a relaxed manner. Trains are just left to natural sounds at summit, a nice touch! Super fleet Warbonnets return circa 1991 – 1994. Needles area gets a look. The film quality is now of the modern era, and looks great with a more contemporary Sante Fe. Double stacks are there to be admired, by those so inclined. Yellow warbonnet freight schemed locos are in mixed and solid sets, as are the super fleet series. Pro shot footage and hot TOFC show how the railroad has changed from previous years. this footage showcases the Santa Fe crossing the vast desert areas heading to Barstow or Needles and east.Those GP60m locomotives are just super! High action feature ends at Barstow Yard. Stockton Jct. gets featured. Tower views and inclusion are great, as are the views of the handsome tower, before it was removed. SP crosses and Union Pacific. The story continues onward. Charles Smiley Presents – Santa Fe Vintage West, is an outstanding program that will become an instant favorite. There is much to love here, for the railfan, modeler and anyone interested in trains. Should also be good for kids, with the combination of the old and newer trains. In closing, the narration ends and the trains roll by the camera for a few minutes, with the natural sound and passing trains sun setting what for many people, is the all time classic American railroad. The railroad lives on in it’s present BNSF form. For those who have witnessed the greatness of the original Santa Fe Railway, this program provides a permanent souvenier. The classic vintage material is my favorite. What else do i take away from this fine show ? Where can I find a pair of those Super Fleet GP60M’s in HO scale? Another outstanding release from Charles Smiley. 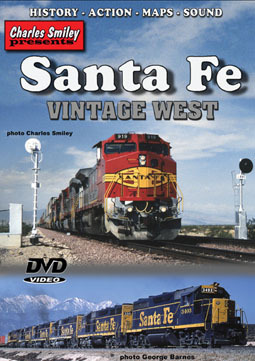 This entry was posted in ATVR Reviews, Charles Smiley Presents and tagged American Train Video Reviews, California, Railroad, Santa Fe, Southern Pacific, tehachapi loop, Train DVD, transportation, Union Pacific by William J. Hudson. Bookmark the permalink.